Sometimes, a company will need to make item adjustment accordingly in the inventory. There are many many circumstances where you have to adjust your inventory items manually. E.g. Product damage, store theft, stock count discrepancy in your physical count or as simple as data entry mistake. Our BMO Online Inventory System Malaysia provides stock adjustment to adjust serial item, physical control item, composite item and normal item. 1. 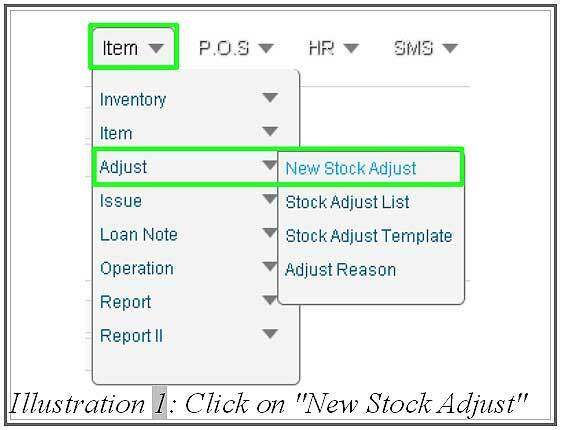 For the beginning of the adjustment, go to “Item > Adjust > New Stock Adjust”. 2. Fill in the “Adjustment Info”. Adjust No Can not change. It will created by the BMO online system automatically. Setup Here To modify the Stock Adjust Template. 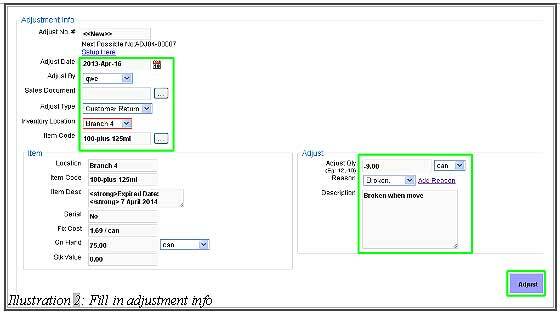 Adjust Date Date for adjustment of the item. Adjust By Person who done the adjustment. -Stock Count To change the quantity at item on hand. 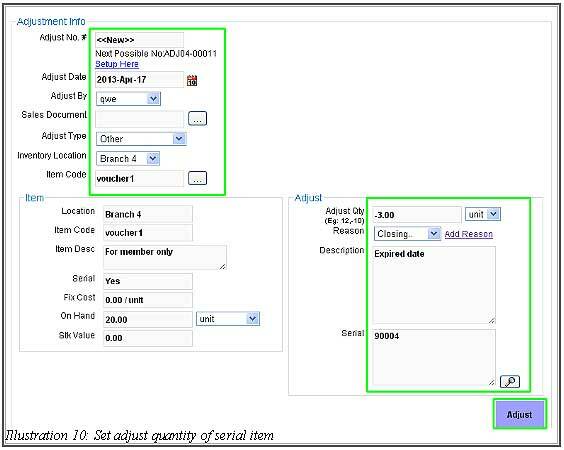 -Write Off To reduce the stock and put negative quantity at the quantity field to decrease the item on hand. Inventory Location Select the inventory location for adjustment of the item. Item Code Select the item which want to adjust. 3. 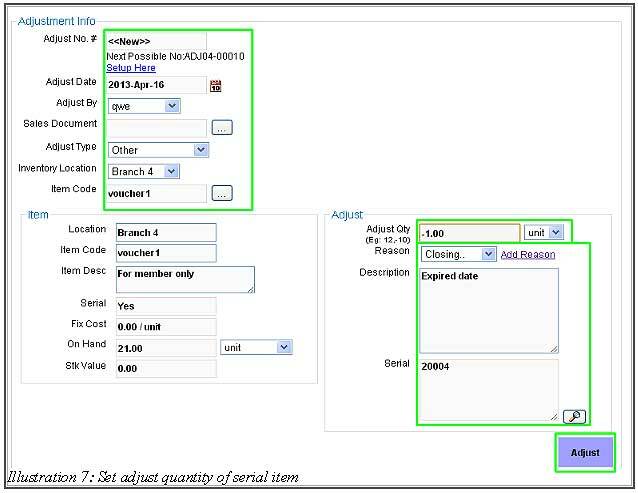 After user selects the“Item Code”, the item details (location, item code, description, serial number(if any), fixed cost, average cost, on hand quantity and Stk value) and the adjust box (Adjust quantity, Reason and Quantity) will be shown . In “Adjust” section, enter the quantity that user want to adjust in “Adjust Qty”. For example, 9 means increase 9 items (on hand item increase) while -9 means move 9 items reduce from inventory (on hand item decrease). 4. Click on “Adjust” to adjust the item. 5. A notification will pop up to inform you that the item is adjusted successfully. Click on “OK”. 1. For adjustment of serial item, user must select “Item Code” which has the serial number. 2. 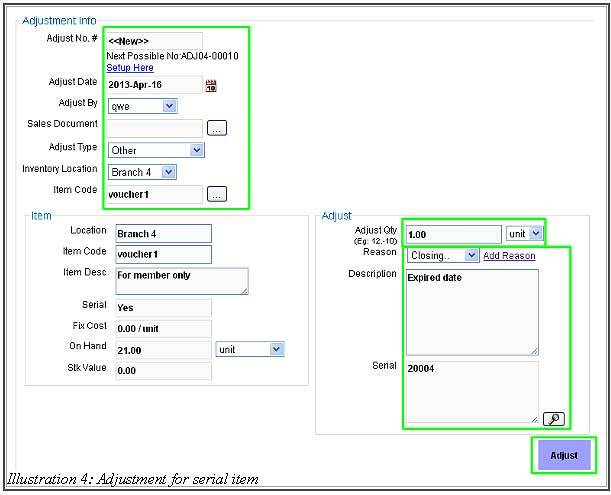 After user enter the adjust quantity then select the serial item code that wanted to adjust, click on “Adjust”. Reminder: User cannot increase the serial quantity here. 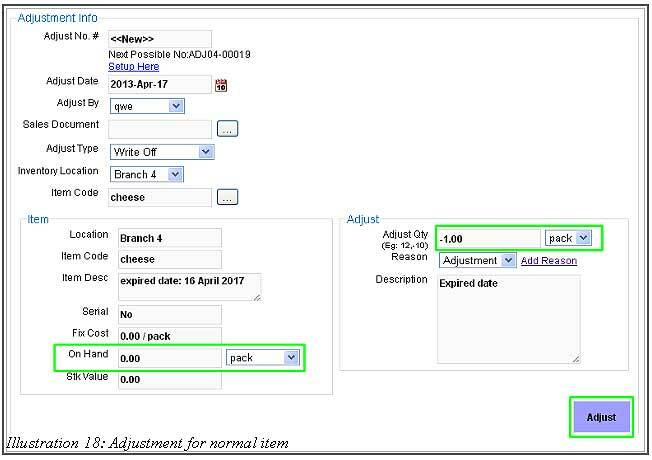 For example, if we set the “Adjust quantity” as 1.00 for increase 1 unit of voucher as shown in the Illustration 4 below, 2 pop up notifications will inform you that user is not allow increase serial item quantity by using this method. 3. We just can decrease the serial item here. So, we set the adjust quantity as -1.00 for decrease the quantity of the serial item quantity. 4. 2 pop up notifications will inform user that serial item has been adjusted successfully. Click on “OK” for both notification. 5. Reminder: Adjust number and the number of serial selected must be equal. If not, adjustment will not be success. Example will shown from Illustration 10 to Illustration 12. 6. 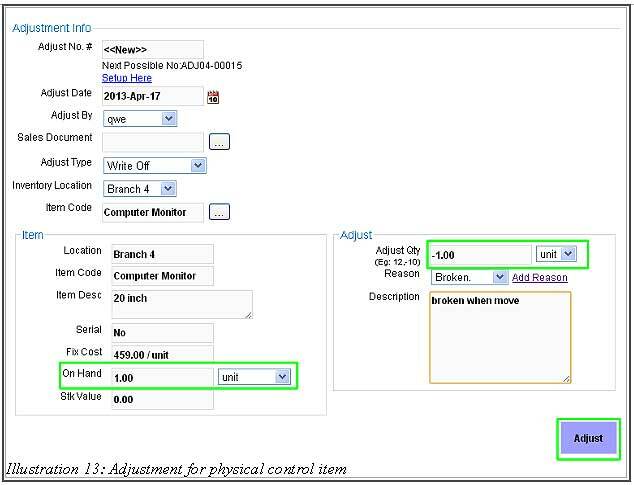 A notification will pop up to tell user about the adjust quantity and number of serial. Click on “OK”. 7. 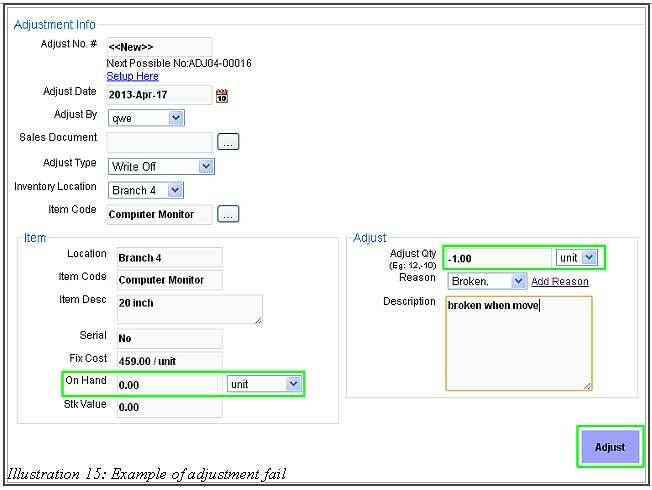 Another notification will pop up to remind user that the adjustment has failed because serial selected is not equal to the adjust quantity inserted. Click on “OK”. 1. When creating a new item, you can decide either to set the item as a physical control item or a normal item. Also, you can only adjust the physical control item if the quantity of physical item do not become a negative number after adjustment. 2. Fill in adjustment info. Please make sure the item is physical control item and not out of stock. After that, click on “Adjust”. 3. A notification will pop up to remind user that adjustment of physical control item successfully done. 4. Illustration below shows the example of the failed adjustment because you want to reduce physical control item which has zero on hand quantity. 5. 2 notifications will pop up to inform you that the failed adjustment for the physical item which has zero on hand quality. Click on “OK” to dismiss both notifications. 1. The steps for adjusting normal item is same as adjustment of the physical control item. The major difference of adjusting physical control item is you can still reduce the quantity of the normal item although on hand quantity is less than zero. 2. A notification will pop up to inform you that the adjustment for normal item is successfully done. Click on “OK” to dismiss message. For composite item, in “Item Code” choose the composite item that you want to adjust. 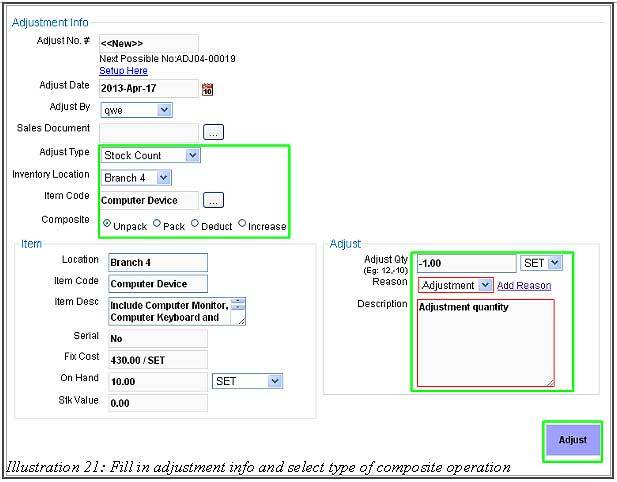 There are four types of adjustment choice (Composite Operation) that you can choose for the composite item, such as “unpack”, “pack”, “deduct” and “increase”. item on hand. 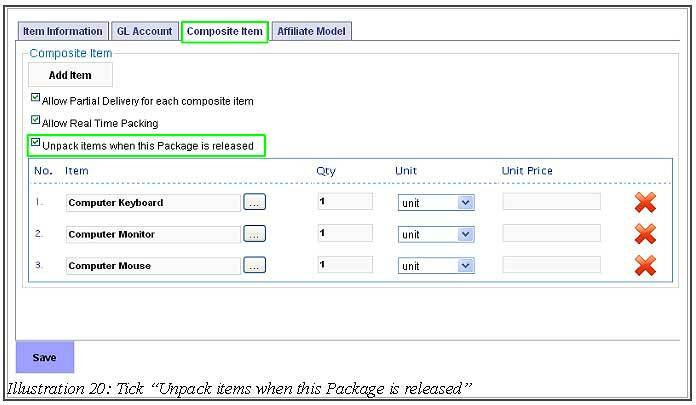 To unpack the composite item, user need check the “Unpack items when this Package is released” (shown in Illustration 20 below) when created this composite item. If not, the composite item can not be unpacked. Reminder: Adjust quantity for unpack must be positive because we increase quantity of on hand composite item. To pack and increase composite item from current item on hand. Deduct To deduct the composite item directly. Increase To increase the composite item directly. 1. Fill in the adjustment info. For composite item, user must select the type of the composite operation. After that, click on “Adjust” to adjust composite item. 2. A notification will pop up to inform users that the adjustment is successfully done.